Enjoy the tranquility of Little Gasparilla Island at this exceptional waterfront pool home. Welcome to the Pineapple House on Little Gasparilla Island. If you are looking for true tranquility, quiet beaches on a secluded tropical island this is the perfect place. The Pineapple house is a Key West inspired pool home on the bay side of Little Gasparilla Island. Enjoy incredible views from the screened in decks, soaring ceilings, fabulous chef's kitchen, and access to the remote white sand beaches, along with fishing, kayaking, snorkeling, and boating. As you pull up to the private boat dock, discover Pineapple House nestled amid lush tropical vegetation and swaying palm trees on beautiful Little Gasparilla Island. This spectacular 4 bedroom Key West style manor features French doors and inviting screened-in wrap around verandas throughout allowing you to soak in the majestic views and salty sea breezes. Leave the real world behind as you stroll over to the secluded sandy shores of this island oasis and bask in the warm Florida sunshine. As you enter Pineapple House you will notice the warm ambiance which is enhanced with tasteful and comfortable beach decor. Organic materials such as rich wood tones and wicker are used throughout to compliment the homes natural surroundings. The natural light and fresh air pour through the multitude of French doors giving an open and airy feeling to the home. Whip up culinary masterpieces in the fully equipped chef’s kitchen complete with high-end appliances and granite countertops. Enjoy the first coffee of the day at the spacious breakfast bar. Dine alfresco or seated comfortably around the rich wood dining table adjacent to the kitchen. Pineapple House has four spacious bedrooms and are peaceful, private, and feature luxury linens for ultimate comfort. Stroll into the lower level master suite with its tasteful beach decor, and large king size bed. An ensuite master bath accompanies the bedroom and offers double sinks, and large tile shower. Step through the French doors and out onto the wrap around screened in veranda and enjoy this tropical paradise. The three well-appointed guest bedrooms all feature luxury linens, rich warm tones, and French doors out onto the wrap around screened-in verandas. 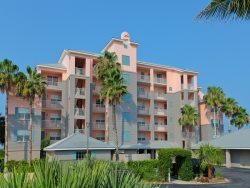 Stroll out onto the brick patio terrace and enjoy the private crystal clear blue pool, or seek adventure and enjoy the supplied kayaks and paddle boards, perfect for exploring all Little Gasparilla Island has to offer. When the sun begins to settle, sip a cocktail from either one of the top floor observation decks as you watch the sky come alive with stars. Whether you’ve come to Little Gasparilla Island for a quiet beach retreat or a grand celebration, Pineapple House is the perfect place to enjoy the best of the island. Upscale shops, restaurants and nightlife are only a short boat ride to Boca Grande. Little Gasparilla Island is a bridgeless island on the shady shores of the Gulf of Mexico. If you are looking for tranquil beaches, away from it all, while vacationing in a spectacular home, Pineapple House on Little Gasparilla is your beach vacation spot. Keep in mind there are no grocery stores, or other business on the island. You will need to purchase your supplies on your way to the marina and bring them with you on the water taxi. Third Bedroom: 1st floor with 1 king. Each bath has linens, towels, soaps and shampoo. Breakfast Bar, Granite Counters, Drip and Keurig Coffee maker, Sub-Zero refrigerator. Margaritaville Blender to mix up those frozen concoctions! Several sun decks to enjoy the views of the island. Rob was fantastic! Very responsive and easy to work with. The house is beautiful, clean and well maintained. Plenty of room in the house for a group of 8-10 people. A very easy walk to the beach, but we spent a ton of time enjoying the pool. This was the best beach house we have ever rented! We will be looking forward to renting again! We had a wonderful time enjoying the beach and pool. The house has lots of room, comfortable beds, and baths, for a large extended family. We were six adults and three children. The kitchen was great for dinning at home. We rented a boat which enabled us to eat out on the mainland and do some shopping. There is a water taxi if you have not rented a boat. The real attraction for us was enjoying the beach and the heated pool with family. We were there the week after Christmas and had the beach almost entirely to ourselves. The house is definitely as beautiful as the picture make it out to be. Robert, the property manager was very helpful with any questions we had. You are able to appreciate the Pineapple house as you arrive at the dock. The amazing construction made this a wonderful home for our stay. The screened in porch on both floors of the home were absolutely key to enjoying the evenings without a single insect! Pool is not immense, but was the most popular place during the day for the kids. Parking for Little Gasparilla Island is available at Eldred's Mariana, located just before the Boca Grande toll bridge at 6301 Boca Grande Causeway, Placida, FL 33946. 941-697-1431. This is also where you will find Pirate's Water Taxi. Parking at the marina is $6 per day. Be sure to put your parking pass in your windshield before heading out on the island. If you arrive after dark and the marina is closed, please contact them the next day and make arrangements to pay for your parking. Is the best option for island access. We can help you to pre-plan your taxi in advance. The water taxi is available during the day and can be at night (limited usage and extra fees apply) Advanced reservations are best. The cost averages about $10.00 per person during the day 8am-5pm. Minimum trip charge of $20. Little Gasparilla Island is a remote tropical island on the salty shores of the Gulf of Mexico, just to the north of Boca Grande, and south of Palm Island this bridge-less island is a real get away. With boat only access, you can truly relax on it's uncrowded beaches, in true island fashion.